It's now official. 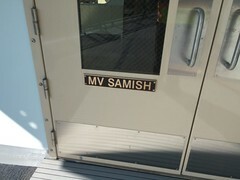 The state has accepted MV Samish. This means Samish now gets its own thread. From this point forward, anything regarding this new vessel should go here. The brand new 144-car Samish is ready to officially join the fleet. That's terrific. She'll be a welcome addition to the fleet. Would really like to go ride it, seeing the Toikae (and hopfully the olympic class) is currently my favroite of the fleet! Where will the maiden voyage be? Anacortes/San Juan Islands? Where will the maiden voyage be? Anacortes/San Juan Islands? Christened/open house in Anacortes on May 20 according to various sources including en.wikipedia.org/wiki/MV_Samish. Still lots of work to be done. 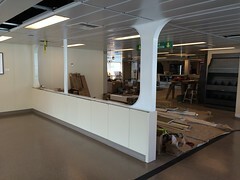 Flooring is being installed and a whole lot of miscellaneous work is taking place. Same Brown, Utilitarian cabin as the Tokitae, I see. Yeah. Based on how all three of the KDT class boats have the same colors, I'm not really surprised. I really wanted to see some variety with this class. They did so good with the Issaquah class cabin refurbishments. Don't know why the new boats aren't getting the same treatment. 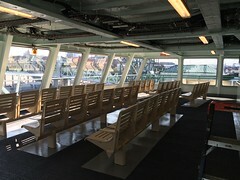 The new bench seats on the Tokitae (and probably Samish-didn't get a real good look) are way too firm. 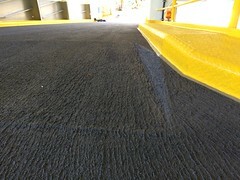 I do like the use of the dark non-skid coating on the outer decks though. Hopefully wont show dirt as bad as the gray. That stuff is not fun to clean. Yeah, but I am pretty sure they are getting refurbished. I was slightly dissapointed in hearing about the Samish's interior. I am crashlament by the way. I have the YouTube Channel Crazy Cathlamet. Nice to meet all of you. The single chairs are great on the Tokitae. The bench seats are the ones that are terribly undercushioned (I don't think that's a word, but I just made it one). 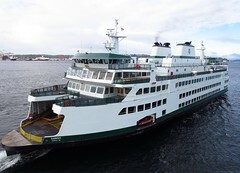 Okay, got the Samish departing Colman Dock this morning to continue sea trials. Nice photos! Can't wait to get a ride on the new boat this summer up in the islands. I'm curious as to what position she will be running. My guess is #2 with Yakima running #3, or vice-versa. I think it's reasonable to predict it will be #2 or #3. I expect they will keep Elwha in the #5 slot. We'll find out soon enough. In any case, thanks for posting the photos. I wonder what boat she is replacing in the San Juan Islands?? The Hyak?? I hope the Yakima and Elwha stay in the Islands. Has anyone seen this yet? The maintenance schedule is currently off-line, but I am almost positive Samish will replace Hyak in the Islands. I think the odds are pretty high she'll serve as Vessel No. 3. For whatever reason, it's offline if you are using Google Chrome or Firefox. 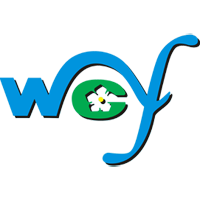 The link works in Internet Explorer...why, I have no idea. Something to do with the hyperlinking isn't working in the other two browsers. Here's the top part of the 22 April update, covering the Supers. Is the Samish going to be in the San Juan all year round as a regular boat??? or just the summer season? I believe it's supposed to be a regular year-round boat in the islands. I don't think it will be moving anytime soon.... the Tokitae is the one that might do more route shuffles than the Samish at this time but don't take my word for any of that... it's home port will be the Anacortes route, I think? Isn't the Hiyu the oldest ferry currently in the fleet? what's the next oldest boat to be replaced when the Chimacum comes to service? one of the Issiquahs or one of the supers? 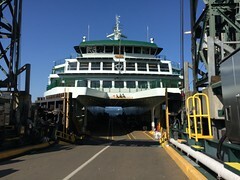 The 1954 EVERGREEN STATE is the oldest ferry in the WSF fleet. Then, the 1958 KLAHOWYA and the 1959 TILLIKUM. The HIYU was built in 1967. Still having a good number of years of service ahead of her, the little HIYU will be the first to go this year as another smaller community or two wants that ferry. 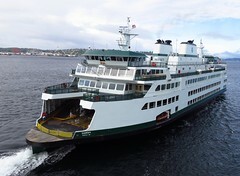 The SAMISH will leave the San Juans at times to visit the Vessel Maintenance Center and get drydocked to keep herself fit and updated for service. I won't be surprised if she replaces a vessel on another run for the same purpose. oh... well I don't know my ferries that well then.... I guess that the Hiyu's compacity does not meet up to the amount of traffic she will create... isn't she the smallest boat currently in the fleet in terms of auto compacity? I guess you meant "capacity" rather than "compacity". I guess you need a spell checker in your web browser. Oh, yes, the checker does detect spellings of words used in Canada and Great Britain. 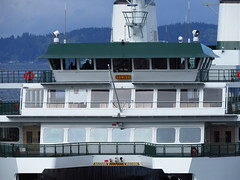 Anyway, the HIYU is the smallest "major ferry" (having a passenger cabin built over the car deck) here on Puget Sound. She carries 34 (40) cars. 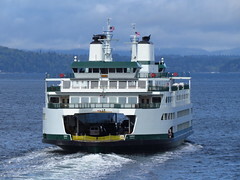 The next major ferries up are two in Pierce County that can carry about 50 cars each. Then, the three KDT ferries at 64. Next up are the ES-Class ferries at 87 (100). SEALTH at 90 (100). The rebuilt I-Class ferries carry 124 (130, originally 100) cars each. Olympic-Class 144 cars. Supers 144 (160). 1972 Jumbos 188 (206). Mark II Jumbos 202 (218). 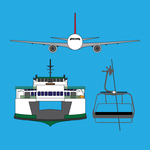 Numbers in (parentheses) are original capacities of the ferries until revised by WSF in recent years due to car sizes, pathway to MES stations, elevator installations, ADA spaces, et al. There's a shiny new Samish at Slip 4 in Anacortes.